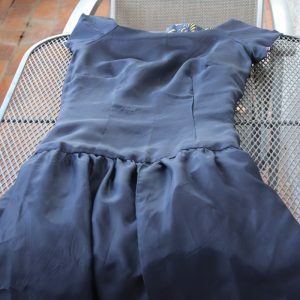 Here comes another dress made from a pattern that I ordered directly at Butterick, while Marvin was staying in the US for three months. I ordered the pattern 5 days before he was leaving and they arrived the evening before he left. 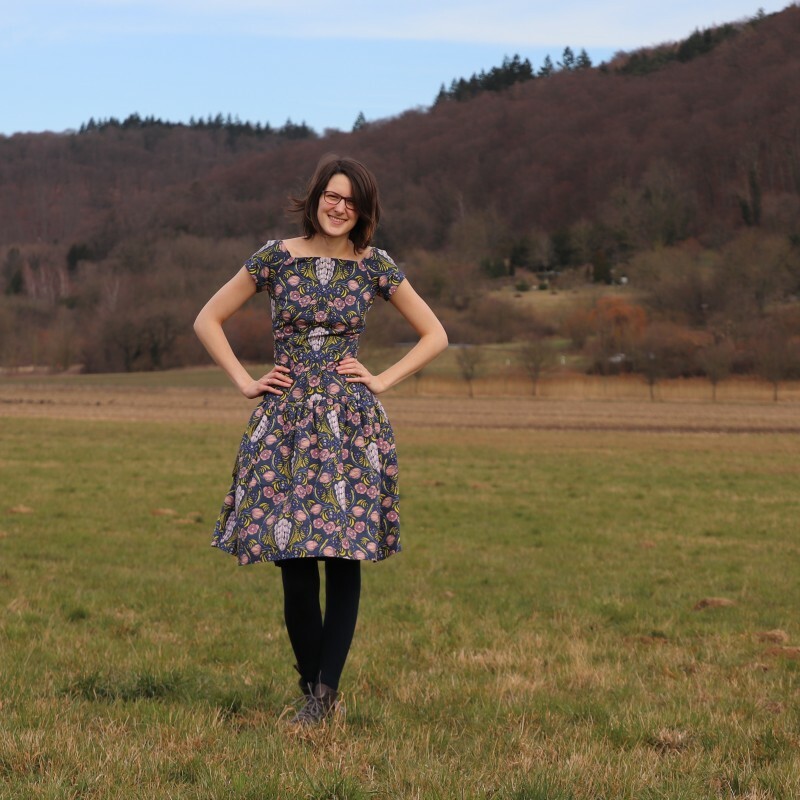 You can read all about the dramatic story here if you wish ;) Soo this is the second pattern I made, it’s another Gretchen Hirsch and Butterick pattern and its name is B4684. 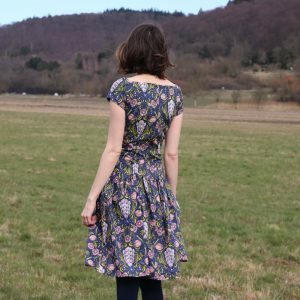 I bought this pattern because I had seen it made from a border print by one of the participants of last year’s Outfit Along and it looked stunning.I love border prints. So I ordered the pattern (for 2.99 $ might I add) so that I would have a back up pattern for border prints. I made all of the border print fabrics I have owned so far (2!) 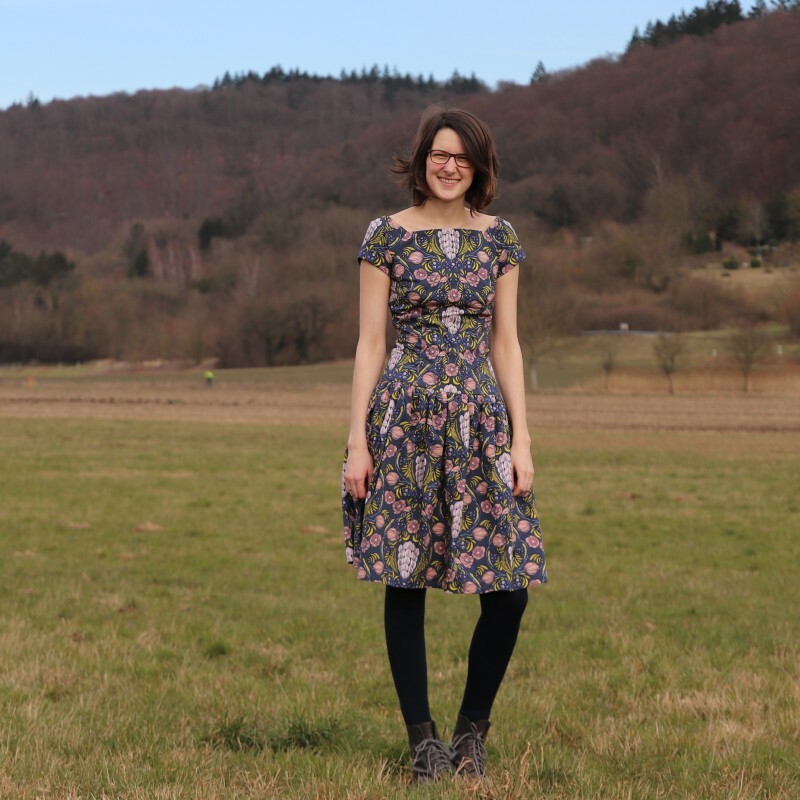 into Sewaholic Cambie dresses. 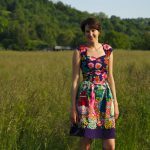 Here is one I made from a flower print and here is my favorite dress made from a Frida Kahlo themed fabric. I didn’t have any border prints in my stash. They are pretty hard to get in my experience. And also I’m trying to reduce my stash a little. It is not that big, I am not that much of a hoarder. A little maybe. However I came to realize, that there are certain fabrics that never get sewn, because there always something brighter and more shiny and new in my stash. 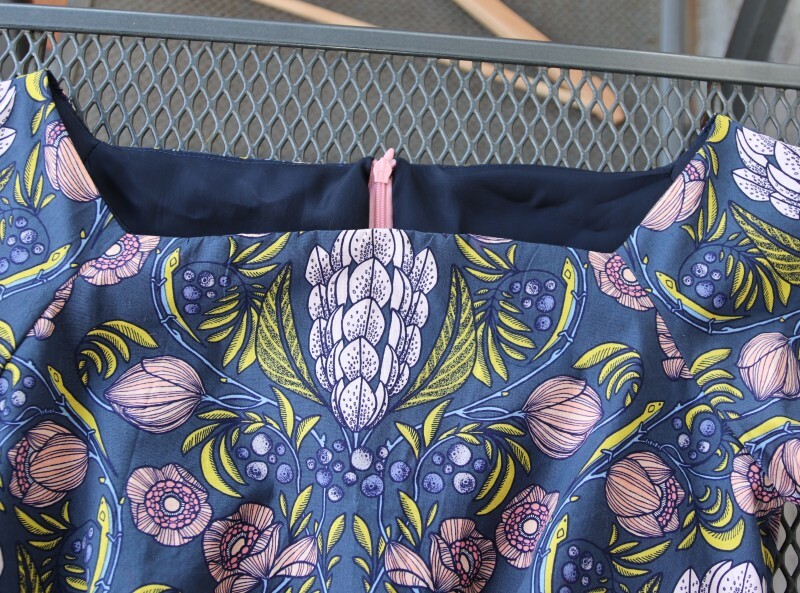 Usually those fabrics aren’t that colorful, just like this one. But I still like it a lot. It’s just not that much ‘fun’ I think. So I thought it would b wise to force myself to finally make something from it. 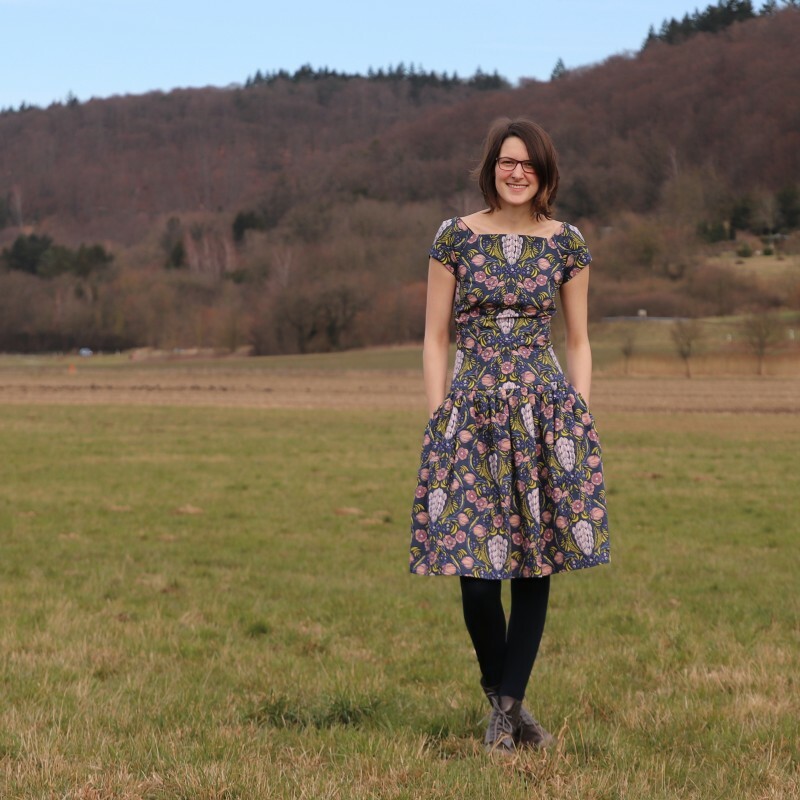 I bought this fabric at a local fair for 10€/m and I bought 2m. 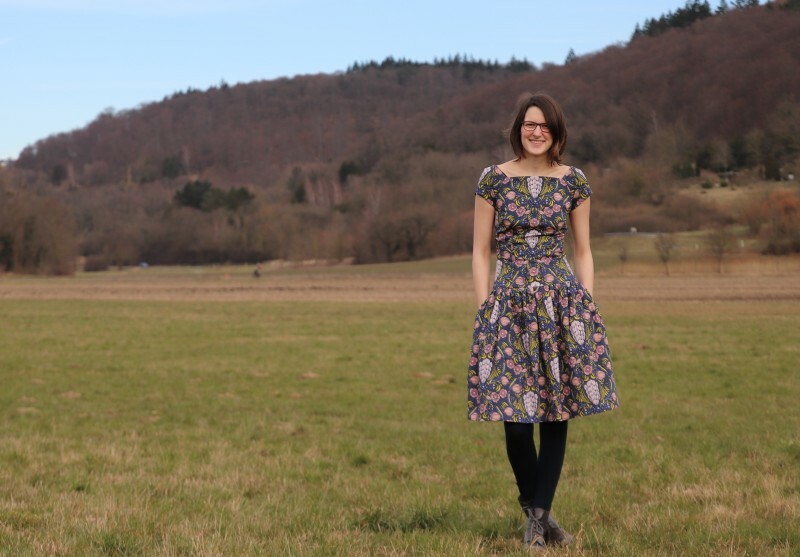 I think the fabric is a good match to the pattern and luckily the pattern only calls for 2.4 m of 115 cm wide fabric. How convenient! I traced size 8 and lengthened by my usual amounts and I made a muslin. The bodice was way too tight from the shoulders down where the armscye ends (so the chest..). Underneath my bust everything looked fine, I had already widened the bodice at the hips and everything fit. It took me two more muslins to get the chest problems more or less under control. More or less because I didn’t have the nerve to make a 4th muslin. What I did to better the situation was widening all the pattern pieces a lot. I also had to widen the shoulder dart, so that the neckline did not gape and I also shortened that dart, I think because my shoulders are more rectangular than those of other people. As you can see in the photo above my shoulders have almost no slope. That wasn’t a good start at all. Kind of like the start I had with my first Gertie dress. Only this time I had the reverse problem: too little space. Luckily the pattern includes a 5/8″ seam allowance and so I was able to make some more changes on the final version. Because still my shoulders and back had not enough moving space. I didn’t follow the instructions. I read them though. 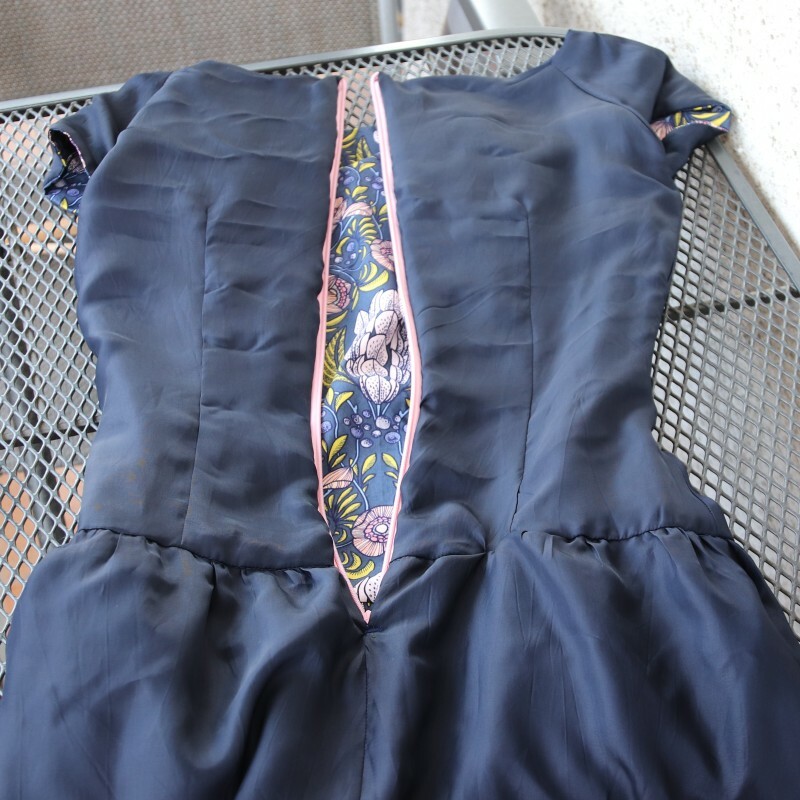 They call for an overlapped zipper (i used an invisible zipper) and the lining skirt is sewn as a petticoat. 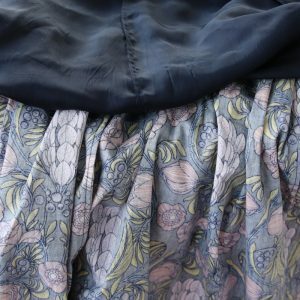 I didn’t read that part that thoroughly and I also didn’t have that much lining so that I ended up making the lining skirt even a little less wide than the outer skirt and I didn’t make a petticoat lining. I also had to ‘change’ the skirt pattern piece. Yes, it is only one piece, no side seam. 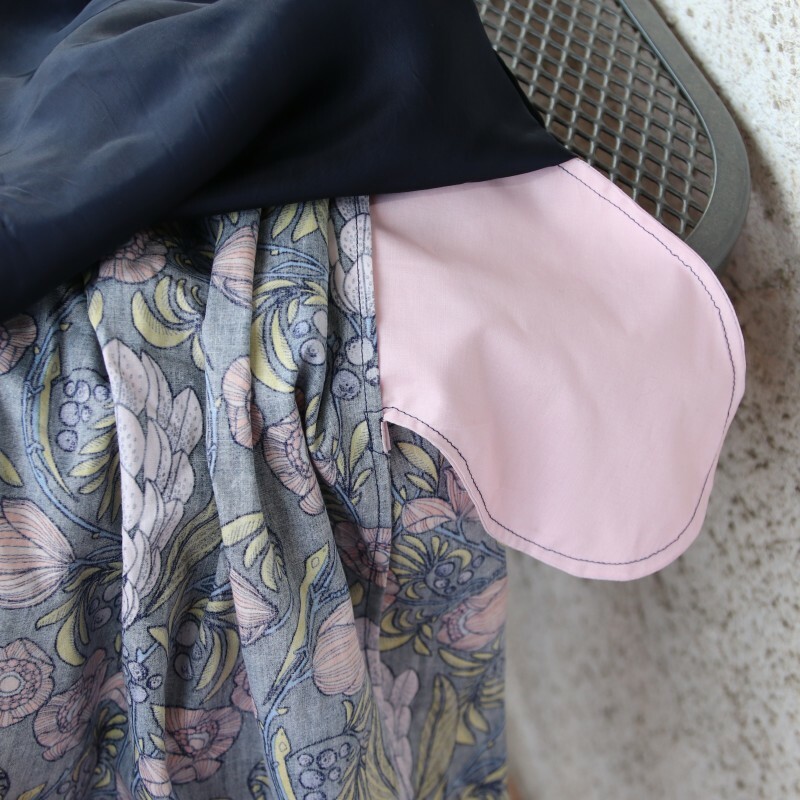 However the pattern pieces are meant to be used on a border print fabric, which means that the fabric grain is parallel to the long side of the skirt, to the hem, everything is turned by 90° compared to how you usually lay pattern pieces on fabric. If you know what I mean! However my fabric wasn’t a border print and the print even had a direction, so I had to cut the pattern pieces as you would usually do. 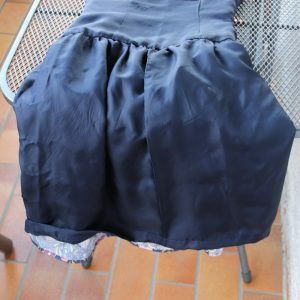 My fabric was only 115cm wide which wasn’t enough to cut the skirt without side seams from it. And so I went with side seams, which meant I was able to install side seam pockets. The pattern wants you to completely line the dress, which I did. Because I think the colors don’t really scream ‘summer dress’ and I only wear unlined dresses in summer. 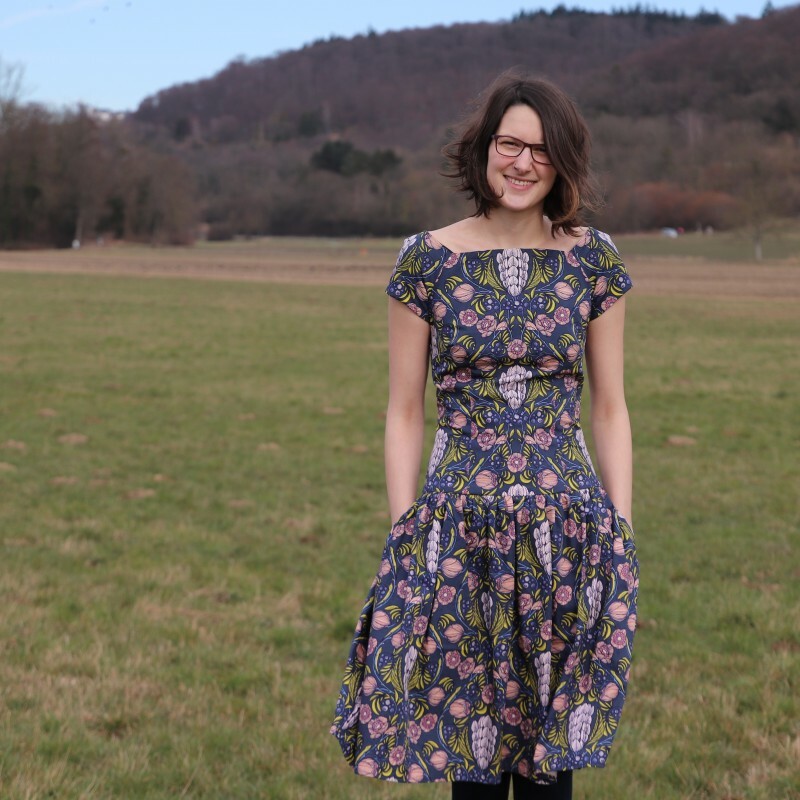 Because I had only 2 m of fabric and because the print had a direction I wasn’t able to cut the 3/4 length sleeves and pattern matching wasn’t a priority either. I’m a little upset that the flower is centered on the front bodice but not on the front skirt too. But I I think I will survive. Apart from those few set backs everything went smoothly. 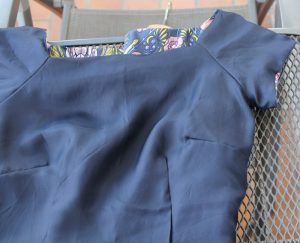 As usual I didn’t finish the seam allownaces in the bodices, but sewed the bodices together at the waist/hip seam by hand. 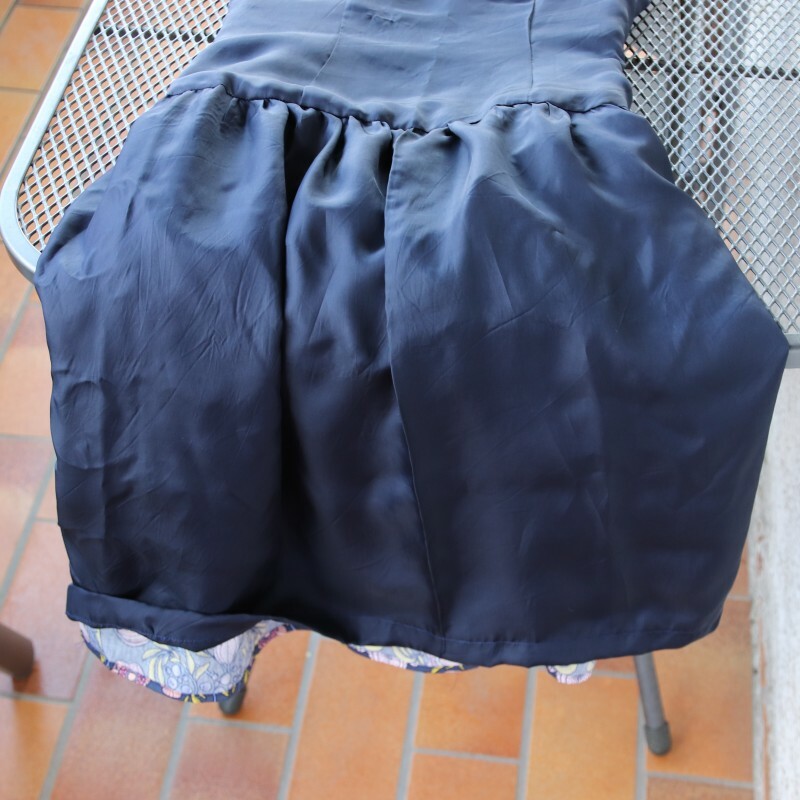 I french seamed all the skirt seams. The hems are machine made, because I’m not insane. I even managed to completely shell the lining by machine, ha! Wasn’t easy, but the sleeves were just short enough to make it happen. Even though I gave my best the dress doesn’t fit me ideally. It is still a little tight at the chest. And I will have to fix this when I make a second version.. if I make a second version. 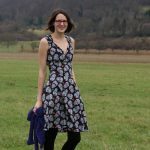 The dropped waist seam is something I will have to get used too, I feel kind of exposed and I’m not sure if I will be able to eat great amounts of cake in this dress. And that’s just off putting. Also I don’t think I have a cardigan that goes well with this dress, because all of my cardigans end a little below my waist and that will look stupid with this dress. I have some full length cardigans as well and maybe one of them will work. If not I have a great excuse to knit a new one. 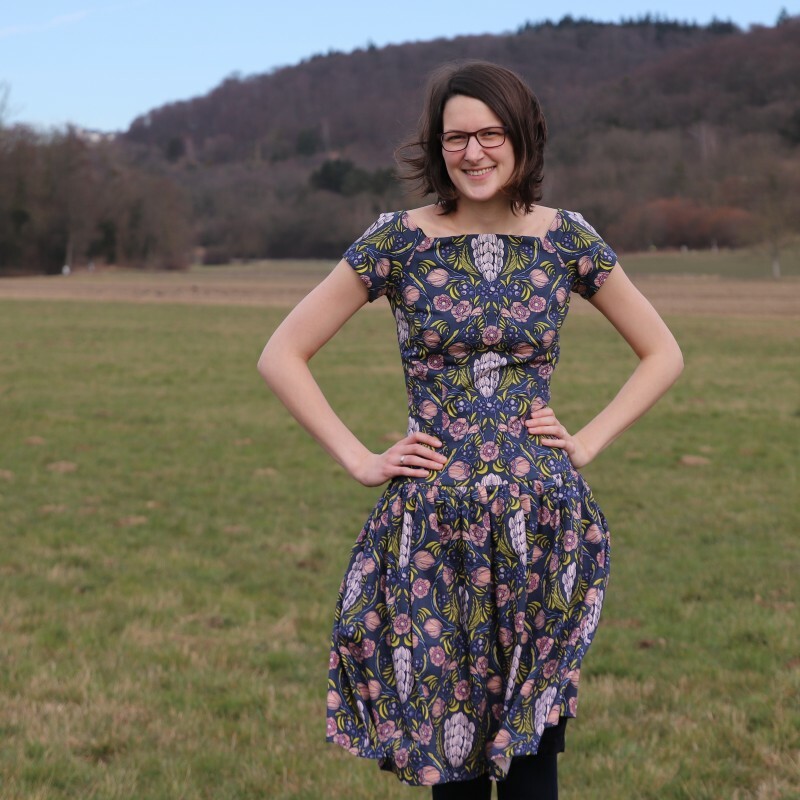 And on the other hand this dress really is a little different from all those dresses I have, which is fun! That’s it! I have to get back to my electric yarn winder station prototype! I can’t wait to show my creation off to you guys! That was an epic adventure for this dress. 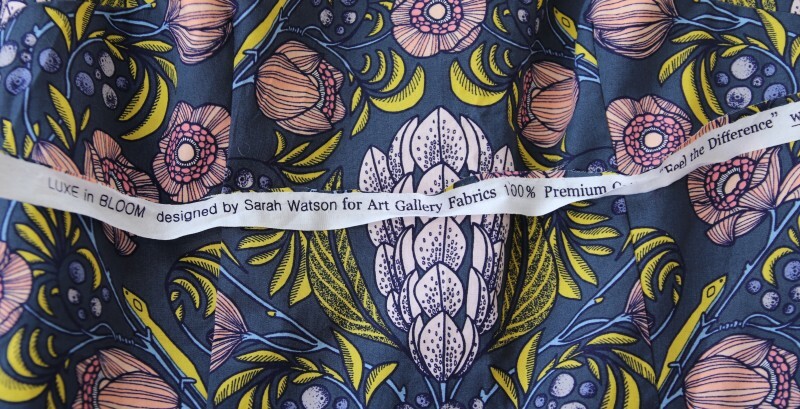 I really like the fabric it is such a pretty print. You will have to keep wearing it to see if you start to feel more comfortable with the dropped waist feature. I think it looks lovely on you! Another really pretty dress that’s beautifully made as always. I rather like the dropped waist as it gives a bit of a vintage feel. Gorgeous! 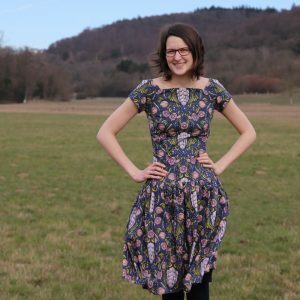 Love the dress and fabric !